From 1963 to 2013, the Vatican, the Roman Catholic Church, had two popes getting ready for the large-scale depopulation by nuclear war. In 1963, the papal encyclical, Pacem in terris, stated that minimum nuclear capability to deter a nuclear attack is acceptable until disarmament is achieved. In 1982, the Vatican had Pope John Paul II announce that nuclear deterrence is morally acceptable as a step on the way toward a progressive disarmament. Did Prophecy Change Their Minds? The word Vatican actually means divining serpent. From a Google search under “Vatican meaning”, we find: The word “Vatican” literally means “Divining Serpent,” and is derived from Vatis = Diviner and Can = Serpent. Vatican City and St. Peter’s Basilica were built on the ancient pagan site called in Latin vaticanus mons or vaticanus collis, which means hill or mountain of prophecy. Catholic means universal, meaning they worship all Gods. As is shown in Acts 7, they even worship the demons and the host of heaven. For a greater understanding of the Sacred Scriptures, I urge you to write, call, or email for information showing that the Roman Catholic Church comes from the Coptic Catholic Church, the God worshippers of Egypt. Yes, the God-worshipping Catholics are the twelve tribes brought out of Egypt by Mosheh, but they never repented of their God worship and have, in fact, spread it to all nations. They rejected the Doctrine of Life. Make us Gods they said, and that is what they made themselves. When a rabbi dies, they make him a God to be worshipped. The words Lord and The Lord are titles not to the Creator Yahweh, nor are they titles to Yahshua Messiah but to rabbis. See Rabbi and Lord in Unger’s Bible Dictionary. Rabbi is found on page 906. “Lord” and “The Lord” are titles of men and demons. Now see the word Lord, which is found on page 665 of this same source reference. Their God worship is from Coptic Catholic. Coptic means Egyptian, and Catholic means they worship all Gods of Egypt and heaven. They rejected the Doctrine of Life for God worship. Verse 42: did you notice this is the house of Israyl? Verse 42 shows it was not Yahweh they were worshipping with sacrifices for forty years in the wilderness. They are the same ones who persecuted Yahweh’s Prophets. Verse 53 shows clearly that they did not keep the Laws of Yahweh. They persecuted and murdered those who practiced Yahweh’s Righteousness. They, the Vatican–the Roman Catholic Church, now abides on the seven hills of Rome, and they are the leaders of the kings of the earth. They now call themselves Roman Catholic instead of Coptic Catholic, but they control all Catholics in all nations and all 4,199 religions of the earth in this generation. However, the religions are beginning to reject those in Rome, as Prophecy shows. Notice the location of this religion and city. Now read what is shown in verse 18. Verse 18: leader of the religions of the earth? Yes, and has been for many years. They do not worship Yahweh or Yahshua. In fact, this city that sits on seven hills fights against them. Read it for yourself. This leader of the religions is located on the seven hills of Rome, but they have world authority to make their appearance in any and all global meetings and concerns. They were for nuclear wars when they thought they would be safe, as they made plans to depopulate the earth. But something changed their minds before the year 2014, so now they are saying that the Vatican forbids nuclear intervention: “Use of nuclear weapons is absolutely prohibited”. Are They Now Believing Yahweh? It seems so. 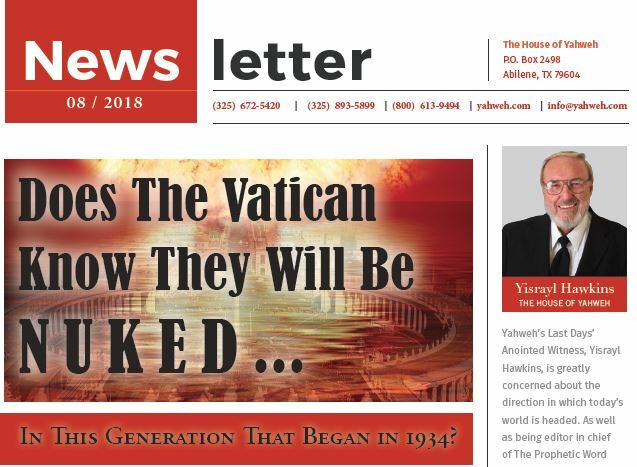 For over thirty years, The House of Yahweh, according to Yahweh’s Prophecies, has been publishing the warning of global destruction by those who reject Yahweh’s Laws and Prophecies. Yahweh is warning the world that the warring path on which they tread, and will not repent, will finish in destruction in this generation, burning up the sinners. 2	And many people will go and say; Come, and let us go up to the mountain; uplifting, of Yahweh, and to the House of the Father of Yaaqob, and He will teach us of His Ways, and we will walk in His Paths. Because the Laws will depart from Zion, and the Word of Yahweh from Yerusalem. 3	And He will judge between many people, and rebuke strong nations afar off; and they will beat their swords into plowshares, and their spears into pruninghooks. Nation will not lift up sword against nation, nor will they learn war anymore. Yes, those practicing sin will come to an end; they will burn themselves up, leaving them neither root nor branch. 1	For, behold, the day comes that will burn like an oven; and all the proud, yes, and all who do wickedly, will be stubble—the day that comes will burn them up, says Father Yahweh; and it will leave them neither root nor branch. 2	But for you who reverence My Name, the Light of Righteousness will arise with healing in its wings; and you will go out, leaping like calves released from the stall. We know they are reading and hearing these Warnings, and many Catholics are expressing the desire for church repentance. The Prophecies have proven themselves 100 percent True, so we know they will not repent as shown in Revelation 9:20-21. 14 Saying to the Last Malak which had the trumpet: Loose the four messengers (the Quartet) who are bound for the great River Euphrates! Yahweh gave the date for these wars in and around the great River Euphrates years before they started. They are written in the book, Birth of the Nuclear Baby. He told us the location and even how many men will be killed in that fourth part of the earth. Verses 14 and 15: a third part of men in that fourth part of the earth that is home to the River Euphrates. Now notice, the leader of these wars, the Vatican, the divining serpent, the Roman Catholic church, that city that reigns over the kings (religions) of the earth. They will not repent of their God worship. 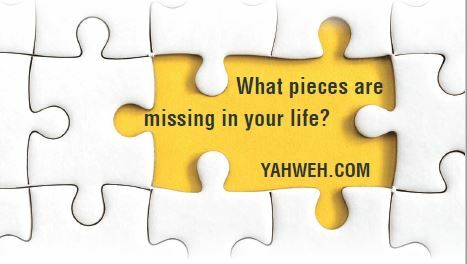 Yahweh says the cause of sickness, disease, confusion, anger, fighting and war is sin. The religions will not repent of sinning. Did you see the cause of wars and the final nuclear war that will wipe out all sinners on earth? 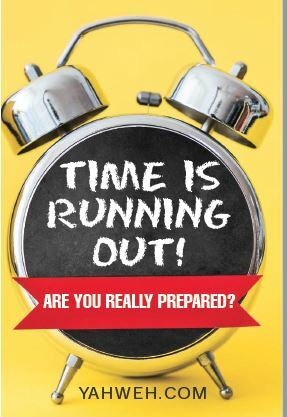 The last wars will only last one hour and will include the Vatican–the Roman Catholic Church, the leader. Verse 5: notice these wars are caused. Verses 10, 17 and 19 show this last nuclear war between all nations will only last one hour and will include the burning of all the God worshippers. Is It Possible to Burn the Earth in One Hour? The answer is yes, and it has become possible only in this present prophesied generation that started in 1934. The Catholics have been reading Yahweh’s Warnings. They will not repent, as a whole. But, notice what Yahweh says to you, as to all 4,199 God-worshipping religions. Revelation 18:4: …come out of her, My People. My People? They belong to Yahweh? Yes! How? Read this in your own Bible or better yet The Book of Yahweh. What makes you belong to Satan? How Do You Break This Tie With Satan? 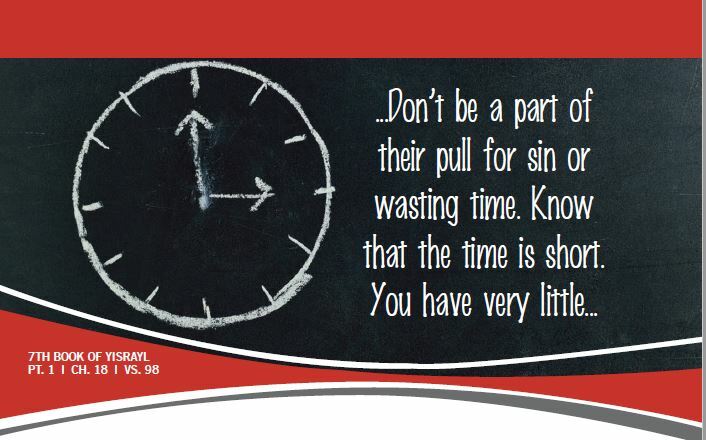 Notice, your sins are not blotted out until you repent and convert to practicing Yahweh’s Righteousness. The Vatican–the Roman Catholic Church will not repent. But you, as an individual, can repent and convert to Righteousness. The sinners are not covered by the Blood of the Lamb, until they repent and convert. The sinners are causing the wars, and they will be wiped out by their own doings. It’s here. It was established in this generation, just as the Prophecy said. There in front of Yahweh (Deut. 12:7), means that at The House of Yahweh will be the Eyes and Heart of Yahweh the Creator and Yahshua the Lamb. The Lamb is High Priest over The House of Yahweh. There, at Yahweh’s House, you will see the Laws of Yahweh taught. You will be given right to Life Eternal. Satan and the Gods cannot give life. 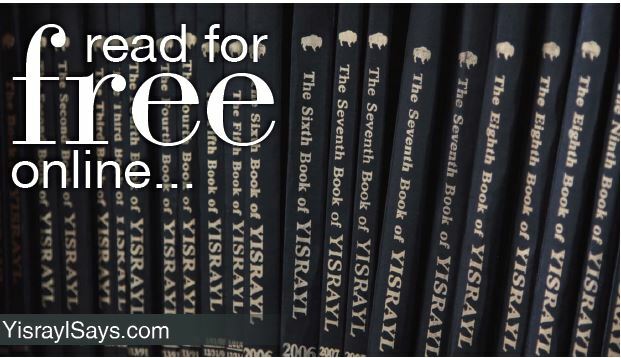 Only Yahweh and Yahshua, the two Persons whose Names were removed from the versions of The Book of Yahweh by order of the city that sits on seven hills.